● DARIX is a PC-based cost-effective audio recording system, suitable for small, medium, and large businesses, in particular, bank business rooms, insurance companies, law offices, police departments, municipalities, customer services, telemarketing, intelligence services, and others. DARIX can handle simultaneously up to 64 audio channels per PC. ● DARIX servers cluster is managed over networks, and supports up to thousands of channels per site. Multiple sites can be connected to create a solution for every enterprise. DARIX can be hooked up to both telephone switchboards and microphones. Recording is initiated and terminated by the level of the signal on-line. ● Audio recording parameters are defined individually per channel. Interrogation while recording is carried out concomitantly with the recording. Recordings are marked by date-time with an option to add the caller’s name, phone number, and other details. Searching is done by date-time with an option to search by name and phone if this information is added. The interrogation is done from the server or remote workstations. ● •The audio recording is based on the silence threshold as a trigger for recording. 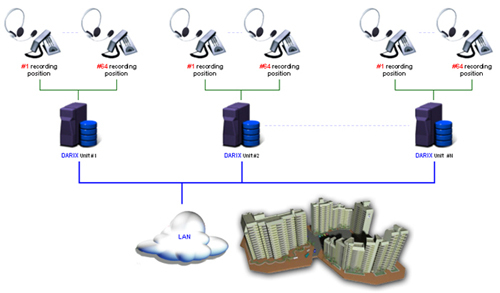 Whenever noise level on the line exceeds the threshold, DARIX will start recording. The minimal noise duration should be at least 5 seconds in order to start the recording.